As we look ahead, it is useful to consider the broad themes of the RAF Strategy: focus on our people, deliver on operations and grow our frontline. Here are just a few of the initiatives that will take us forward into 2019. As part of the multi-billion-pound contract to supply Qatar with 24 Typhoon and 9 Hawk T2 aircraft, the recently reformed 12 Sqn will integrate Qatari personnel, including pilots and ground-crew, from 2019. The personnel will be stationed initially at RAF Coningsby, and then in Qatar, undertaking a package of training and co-operation with their UK counterparts. It represents a unique initiative, and not since the Second World War and the Battle of Britain has the RAF formed a squadron with another nation. The RAF will also look forward to growing its capabilities and the Next Generation Air Force; growing further its vital ISTAR and RPAS capabilities; sustaining its Air Mobility Forces, which are essential to every part of Defence's operations; and expanding further its capabilities in space, cyber and command and control. The RAF will continue to deliver the Nation's air and space power; sustaining its extensive operational commitments; working with NATO and international allies; and standing ready to support any contingency at home or abroad. In 2019 the RAF will see continued development of the Typhoon and Lightning Forces. New facilities at RAF Marham will provide an excellent real-life training environment, replicating the challenges that both pilots and ground crew will face in supporting and operating the new aircraft. The second half of 2018 saw the conclusion of the NATO Enhanced Air Policing mission in Romania. This operation was conducted by 1(F) Sqn based at Mihail Kogălniceanu Air Base near Constanta on the Black Sea. The Sqn was busy during August 2018 with several launches carried out to investigate Russian aircraft over the western Black Sea. All the deployed elements returned to the UK by the middle of September 2018. Three CH-47 Chinooks deployed to Mali in support of the French counter terrorist Op Barkhane and provided heavy lift helicopter capability that was previously absent in that theatre. The RAF detachment was a very welcome addition and made a significant operational impact. The RAF provided the manning for the deployed British Role 2 Hospital in support of the UN mission in South Sudan. This was the first time for many years that the RAF Medical services had been called upon to lead such a deployment at this scale. This operation, called to support the civil powers following the Salisbury chemical weapon incident, saw personnel deployed from 20 Wg RAF Regiment based at RAF Honington. On 5 September 2018, the Prime Minister made a statement to Parliament about those suspected of the attempted murder of Sergei and Yulia Skripal and the subsequent poisoning of Dawn Sturgess and Charlie Rowley. Although Op MORLOP has now drawn to a close, the MoD continues to work closely with partners across government as part of the ongoing Salisbury investigation. In recognition of the dangerous and difficult work involved in decontaminating Salisbury of the deadly nerve agent, Novichok, the Joint CBRN Task Force were awarded the Hero at Home – Unit 'Millie' at the 2018 Sun Military Awards on 13 December 2018. This operation saw the deployment of an A400M to Indonesia in support of humanitarian relief efforts following the devastating tsunami and earthquake. 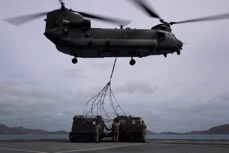 On board were 1,280 much-needed shelter kits and 288 hygiene kits, as part of the £3 million pledged by the Department for International Development (DFID) to the relief effort. 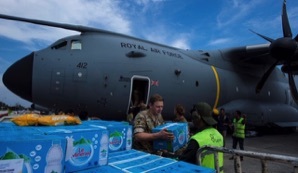 The aircraft was also carrying 3 tonnes of Indonesian supplies, in addition to the 17.5 tonnes of UK aid. A wide range of RAF Force Elements were deployed to Oman for the largest exercise of its kind in 17 years. With over 5500 personnel from all three Services taking part, SS3 built tactical experience, resilience in adverse conditions and coalition teamwork. The Exercise culminated in November 2018 with a major UK-Omani firepower demonstration, including armoured combat power manoeuvring in the desert, air-land integration and an amphibious assault with naval support. Over the two days, 11/12 July 2018, CAS hosted the annual Air Power Conference (APC). Dubbed the conceptual jewel in the RAF100 crown, APC18 focussed on the future, with its theme of 'Building the Next Generation Air Force'. - The next RAF Typhoon sqn will be IX(B) Sqn, which will operate from RAF Lossiemouth as part of the continued expansion of the Typhoon Force. 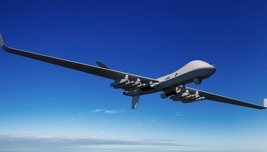 - The first RAF sqn to be equipped with the Protector RG Mk.1 Remotely Piloted Air System (RPAS) will be 31 Sqn. - No 11 Gp will re-form as a Multi-Domain Operations Group, combining the COS Ops Area of Operations, the Air Battle Staff and the Space and Battlespace Management Force into a single unified 2-star Area of Responsibility. - In recognition of the RAF being given responsibility for C2 of the Space Domain, APC19 will be called the Air & Space Power Conference 2019, with a significant focus given over to Space and Multi Domain Operations. 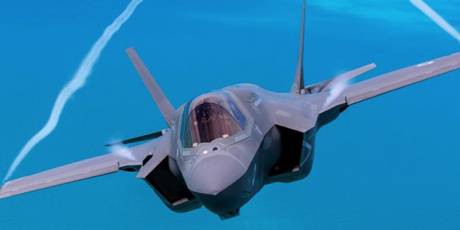 A number of key developments for the F35B Lightning Programme came to fruition in 2018. In January, it was announced that the first ab initio Lightning pilots – one each from the RAF and RN – had completed their initial flights on the aircraft at Marine Corps Air Station Beaufort, South Carolina. In April, 617 Sqn reformed at a special event in Washington DC, where CAS confirmed that the Sqn would be the first to fly the UK's state-of-the-art F-35 fighter jets – the most advanced and dynamic fighter aircraft in the RAF's 100-year history. In June, the first of the UK's Lightnings arrived at their new home at RAF Marham. 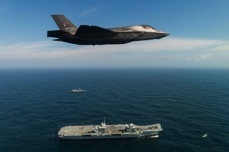 The four F-35 aircraft took off from Beaufort and were flown by British pilots from 617 Sqn. The first public appearance of the aircraft was a three-ship over Buckingham Palace on 10 July 2018 and in August 2018, a further five F35 aircraft arrived at RAF Marham, bringing the total to 9. The first F-35 Lightning carrier deck landings on HMS Queen Elizabeth took place on 25 September 2018. 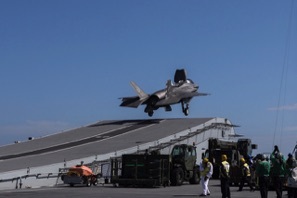 Sqn Ldr Andy Edgell and Cdr Nathan Gray were the first pilots to land their F-35 Lightnings on board the carrier. The landings marked the start of more than 500 take-offs and landings set to take place during a comprehensive 11-week test and evaluation process. The return of 'Carrier Strike' to the UK comes eight years after a fighter jet last landed on a British carrier. The celebrations continued into RIAT where the RAF returned to Fairford on 13 July 2018 for an enhanced 3-day public event featuring a Royal Review and a reported 185,000 visitors. With over seven hours of flying on each of the three days, the Tattoo proved to be a fantastic opportunity for the public to engage with the Service. A highlight was the arrival of Protector, the new RPAS, which flew non-stop from the USA, landing at Fairford in time for RIAT. The flight from North Dakota to Gloucestershire was the first crossing of the Atlantic by a Medium Altitude RPAS and the first time one has entered UK airspace under beyond line-of-sight communication control. The UK is the lead customer for the next-generation aircraft which will be known as the Protector RG Mk.1 when it enters service in the early 2020s. On 1 November 2018, No 11 Gp reformed under the command of AVM Ian Duguid OBE. The new Gp combined the COS Ops Area of Operations, the Air Battle Staff and the Space and Battlespace Management Force into a single Multi-Domain Operations Group. The Gp is responsible for planning and delivering air and space effects, synchronized and integrated with cyber and information activities. ACM Sir Stephen Hillier will step down as CAS in 2019. His replacement, AM Mike Wigston (DComCap & AMP&C) was announced in December 2018. 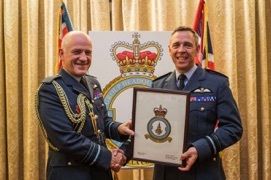 Air Cdre T N Jennings OBE was promoted to AVM as DLS (RAF) with effect from 29 September 2018 in succession to AVM A Mardell who has now retired. AVM I Duguid OBE took post as AOC 11 Gp with effect from 1 November 2018. 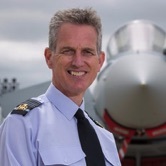 Air Cdre S D Ellard was promoted in December 2018 to be AOC 38 Gp in succession to AVM S C Gray CB OBE whose next appointment is yet to be announced. AVM R J Knighton CB has been promoted to AM to be Deputy Chief of the Defence Staff (Military Capability) in January 2019 in succession to Lt Gen Sir Mark Poffley KCB OBE. Air Cdre S M Miller is to be AO Force Protection, Force Protection Force Commander and Commandant General RAF Regiment in May 2019 in succession to Air Cdre R F J Clifford OBE. The RAF's Centenary on 1 April 2018 was marked by a series of events to commemorate 100 years of astonishing service. The traditional Founders' Day service at St Clement Danes Church allowed former and serving members of the RAF to reflect on the service and sacrifice of those who have gone before. 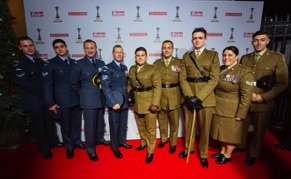 A special Centenary message, received from Her Majesty The Queen, was presented for the first time, and the RAF100 Baton Relay was launched, signalling the start of the wider RAF100 programme of events that would see involvement from the RAF Whole Force and family over the following 6 months. 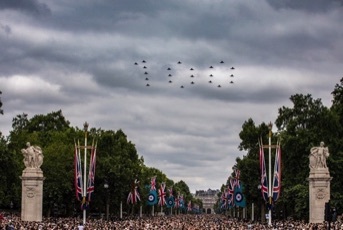 The RAF assembled again in Central London 100 days later, on 10 July 2018, this time on a considerably larger scale, as part of the RAF100 Parade and Flypast. The day offered an opportunity to reflect and commemorate the first 100 years of the RAF, with wreath laying at the RAF Memorial and a commemorative service at Westminster Abbey. To celebrate the RAF today, a parade of over 1000 personnel marched down The Mall to Buckingham Palace forecourt, where Her Majesty The Queen presented a new Queen's Colour. 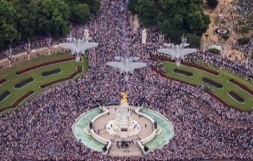 The Royal Family, those amassed on the forecourt and the tens of thousands of members of the public gathered on The Mall, then witnessed a flypast of 103 RAF aircraft. 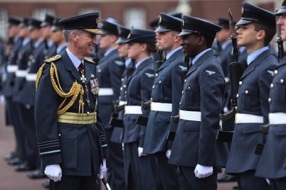 Following the flypast, a reception hosted on Horse Guards Parade offered RAF personnel and their families the chance to celebrate the RAF's historic milestone and their contribution to the day's events.